Good morning, blog readers! I’m just popping in to let you all know that while I’m not regularly blogging right now, I have plans for future blogs. At the moment, my current novel (tentatively named The Charming Spy) is sitting at 71,000 words and I’m getting eager to get as much writing in as I can to finish it up. This novel is about Sir Bramwell Stevens, whom we have met in several other of my novels, and Miss Rose Wilkinson, the niece of a suspected traitor. I’ve begun writing the last few chapters and it’s very exciting! I find myself getting nervous for my characters while I write, but as with all romance novels, it will end happily! Off I go back to writing! Thank you all so much for reading! Have a great week! Good morning, everyone! I hope you’ve all had a great week. We’ve got a cold running through the house, but gratefully we’re nearing the end of it. Today I’m going to tell you all a little something about how I write. There are lots of organizational systems out there that are meant to help authors, but I’m very much stuck in my ways. 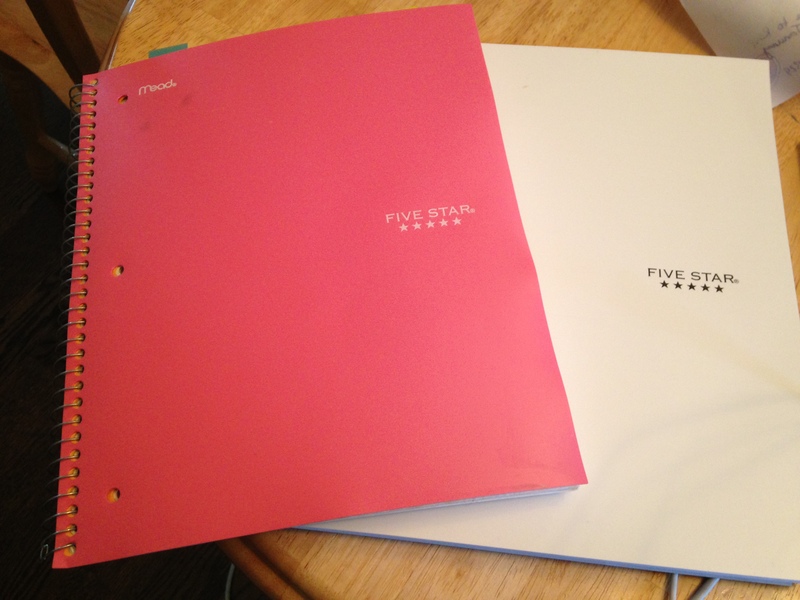 I am a notebook kind of girl. The first thing I do when plotting a novel is: I write my ideas down. I have a whole section of my notebooks reserved for future plot ideas. And they’re generally quite vague in details, just a sentence or two. For example: for my second novel my line was “Previously best friends, he is spy wanting to protect her, she feels abandoned, villains threaten her and force him to keep her save.” Then the more I think about the plot, the more details I put in. I find photos for inspiration, think of names, and then I begin to write character outlines. My character outlines are generally a page long and consist of my hero and heroine’s age, appearance, habits, background, family, scent, sounds, likes, and dislikes, etc. 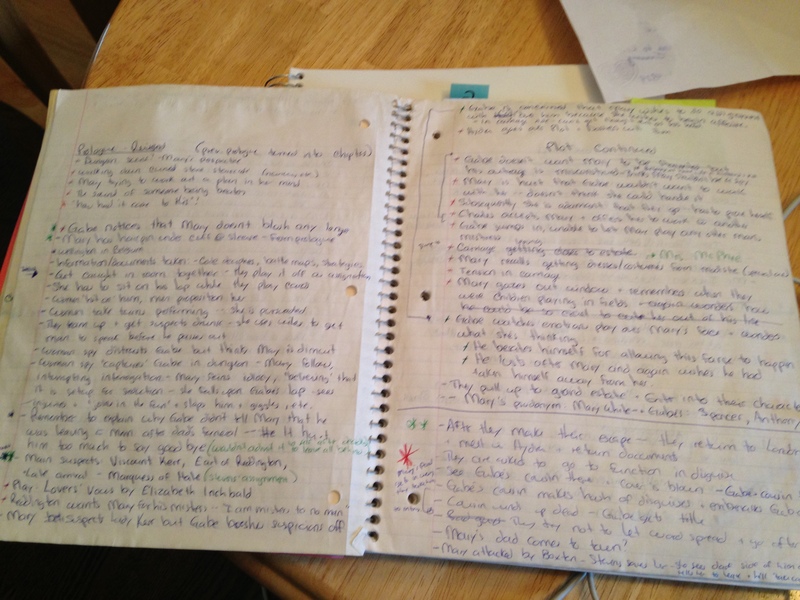 From there, I begin writing a general plot outline so that I know where the story is going to take me. This is never a ‘set-in-stone’ outline; I find that mine changes quite a bit when my characters take form… they like to lead me in different directions unexpectedly. Because my hero and heroine change my plot so frequently, once I write a much more detailed plot outline, I can only write one to two pages in advance. Only once I have typed the pages will I know for certain where to go next. For that reason I type and write notes alternately. Once I have my detailed plot notes I sit down to type. During the week I have difficulty finding time, as with four children, my days are filled. My eldest is in Kindergarten, so my days aren’t as hectic as they once were, but with trips to and from school with my other three children, I am still quite busy. Thankfully, my husband has been so good to me and gives me time on the weekends to dedicate to writing. 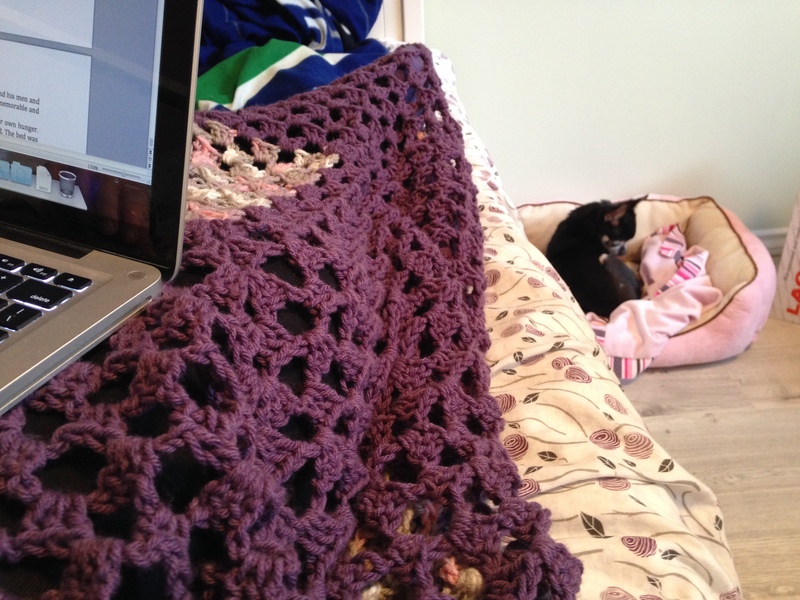 That is when I hide away in my office, curl up with a blanket and my laptop and get to working! I think that is enough about my writing for today. If you have any questions about my process, please feel free to comment! I would be pleased to answer any questions you have. 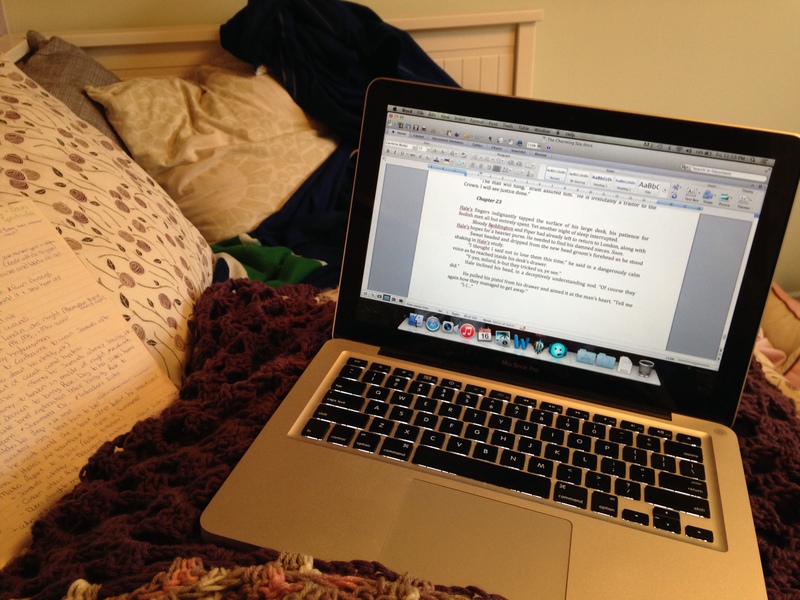 Stay tuned for another blog about how I write focusing on research and the ever-challenging historical timeline! Thank you all for reading! Have a great Wednesday! Good evening, blog readers! Wow. It’s been almost two weeks since I’ve written a blog post. Sorry! We dealt with the kids being sick with nasty colds and other issues, all of which have been taken care of. My children are all well recovered and running about like little monkeys once again. I just finished reading two great books, which I’ve reviewed on Goodreads. They were Fried Windows: In A Light White Sauce by Elgon Williams and Sitnalta by Alisse Lee Goldenberg. I confess that excluding J. K. Rowling’s Harry Potter series, I have never read anything akin to fantasy before these two novels. I read Historical Romance nearly exclusively (though I intend to remedy that). But I must say, that I truly enjoyed both of these novels. Sitnalta was a light and calming read while also adventurous and interesting. Fried Windows: In A Light White Sauce brought me into an entirely different world. It was wonderfully and magically entertaining. Things got rather busy for me once I signed the contracts with my publisher; there were a lot of behind-the-scenes things that were required of me and I needed to re-edit my five novels. Things are just now calming down, so today I began the process of re-absorbing myself in my next novel. As I am already a quarter of the way through writing it, I must re-read what I’ve already written before I start writing again. I must say, I am rather excited about this one! Of course, I’m always excited about my current novel! I plan to continue writing blogs, though I cannot say how many of them will be about new foods that I try. Each time I try something new, however, I promise to take photos. For now, you will likely hear about the progress of my writing, books, or other of my hobbies. Good morning, everyone! As I mentioned in my previous blog, I haven’t been doing any real cooking lately. Last night for dinner we had scrambled eggs, hash browns, and cheesy sausages. So, naturally, I haven’t had much in the way of material for food-related blogs. Alas, I thought I would share something about myself. As most of you probably already know, I began writing as a young child, mostly scribbles in notebooks that I claimed were novels. But what actually began me wanting to write true stories was a book that I had read by Betsy Byars called Beans on the Roof. It is about a young boy wants to write a story. After I put down that book, I picked up a notebook and began to write in earnest. I have countless notebooks filled with short stories that I had written as a child and throughout my adolescence. 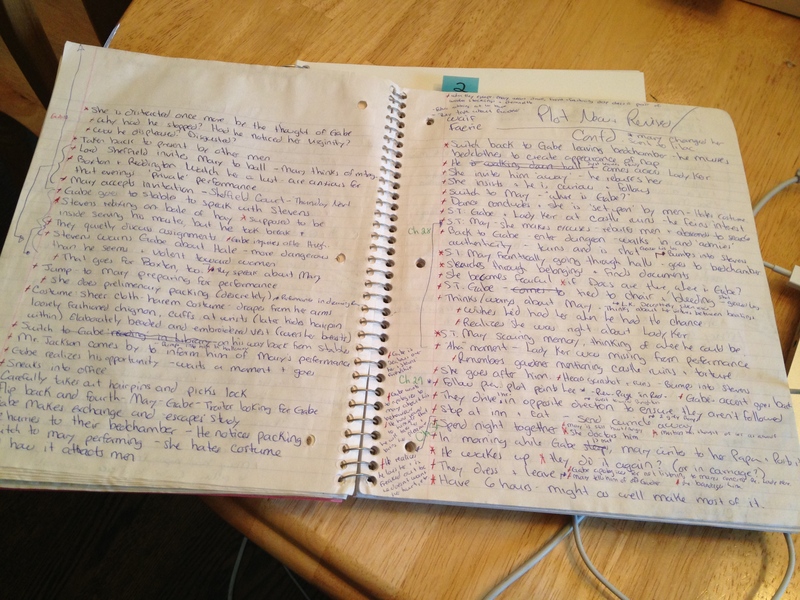 I believe that at the time I preferred mystery and adventure stories, as was evident from my writing. By the time I was in my pre-teen and early teen years, I found that my writing turned into poetry; mostly sappy love poems or angry teen poems. Once my office is set up and I have unpacked all of my boxes, I will gladly share some of these with you. Honestly, they’re laughable. If you have read any of my bios or my webpage, you will know the rest of my writing story. By the age of fifteen I was at the grocery store with my Mom and I asked her if I could pick a book to read. She said yes, but, because she was in the lineup to pay, I had to be quick. I ran to the book section and picked the book with the cover that caught my attention the most. 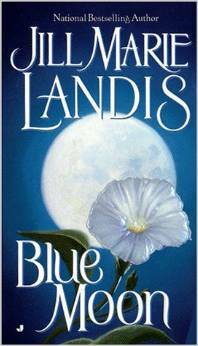 That book was Blue Moon by Jill Marie Landis. This book brought me into a world I had never known existed. The world of historical romance. I was in love. Since then, I haven’t stopped reading the genre. The rest is pretty simple; I started wishing that I could find novels with very specific plot lines. I read the backs of books, searching and searching for the exact novels that I wanted to read. At the urging of my husband (thank you!) I began to write plot outlines for novels, pulled up my computer, put my hands to the keys, and wrote. I was finally able to have books with the exact plot that I loved and wanted to read. It is likely that I will write further blog posts on the subject, but these are the basics on how I got started.